Start making the photo stand base using the wire. Loop the wire around your finger. Remove your finger, hold the wire and continue to make circles until you have about five centimeters diameter. Turn the wire until the photo stand base center and after pull the wire up. Continue turning the wire giving it a flamingo shape, creating its body and beak. After finishing shaping the beak, loop the wire one more time, making a small circle behind the beak. This circle will hold your photo print. Cut the wire with a wire cutter. Turn the pink chenille stem around the wire, from the base to the beginning of the beak. Turn a small piece of white chenille stem right after the end of the pink chenille stem. Turn a small piece of black chenille stem right after the end of the white chenille stem, forming the flamingo beak. 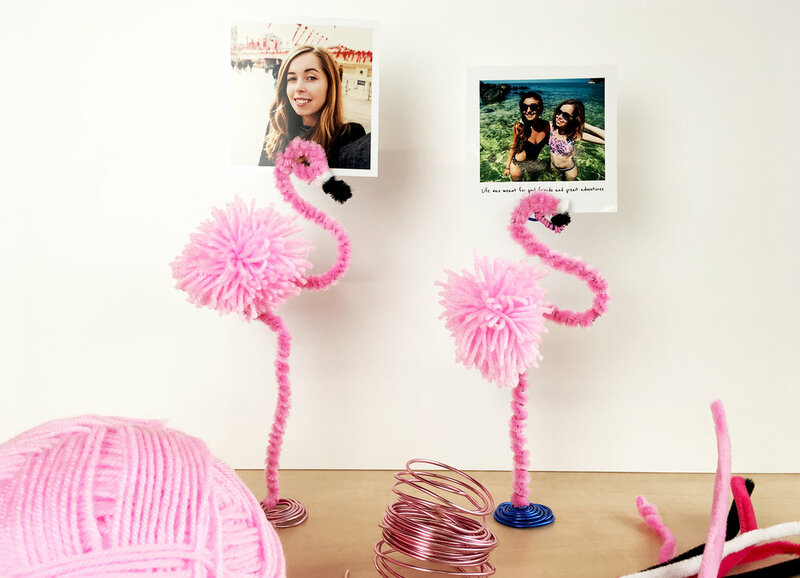 Make a pompom using the pink wool. Cut a ten centimeters piece of the pink woolen yarn and set it aside before you begin wrapping- you'll need it to tie off the pompom. Wrap the yarn around your four fingers about 80 times. Thread a piece of yarn between your middle fingers and tie it in a knot around the yarn wraps. Snip the ends, following the slight curve of the wraps. Trim the ends if necessary. Cut a ten centimeters piece of the pink woolen yarn. Pass this piece underneath the other yarn piece you used to tie the pompom. If necessary, use the help of a think needle. 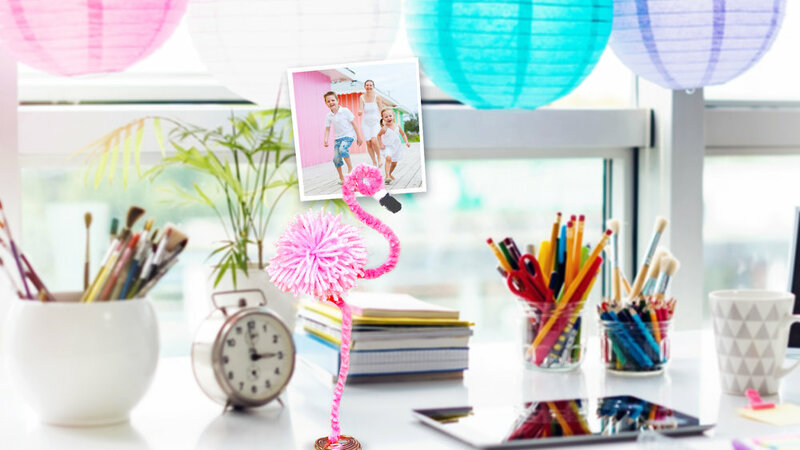 Use this piece to fasten the pompom onto the flamingo. Place your photo print square M in the wire circle. It can be a little bit tricky getting it to stand balanced. Make sure the base is broad enough, and "reshape" the flamingo body to create balance if necessary.